Being both mindful and compassionate leads to greater ease and well-being in our daily lives. That's what I'm sharing with people in 'Life Falls Apart, but You Don't Have To,' says Julie Potiker. SAN DIEGO, CA, August 23, 2018 — The San Diego Union-Tribune successfully launched its first book festival a year ago, drawing more than 10,000 book lovers to Liberty Station in Point Loma, CA. The San Diego Union-Tribune Festival of Books returns on Saturday, Aug. 25, 2018, from 10 a.m. to 5 p.m., and the free event is expected to be even bigger this year, connecting readers, booksellers, authors, and businesses. The excitement of last year's inaugural event has brought several new authors in 2018 who will participate in 30 new panel discussions at Liberty Station on Historic Decatur Road. Mindfulness author Julie Potiker will be participating in the Self-Improvement panel (along with authors Ken Druck and Christine Marie Frey), and will be sharing insights from her new book: “Life Falls Apart, but You Don't Have To: Mindful Methods for Staying Calm In the Midst of Chaos.” This panel is from 1:15 – 2:00 p.m. and will be held in the foyer. The kick-off will be presented by Jeff Light, publisher and editor in chief for The San Diego Union-Tribune, and Tom Karlo, general manager for KPBS, the Union-Tribune's partner for the festival. Following will be a free session called “Fake News, Real Problem.” This will be a panel discussion with Lora Cicalo, The San Diego Union-Tribune's managing editor; Matthew T. Hall, the Union-Tribune's editorial and opinion director; and Brooke Binkowski, a multimedia journalist and former managing editor of www.Snopes.com. In addition, The San Diego Union-Tribune Festival of Books will offer a conversation about the border, which will be presented in Spanish. Attendees can also visit more than 60 exhibitors in Luce Court or the Author Alley tent, where Julie Potiker will be signing and selling books. 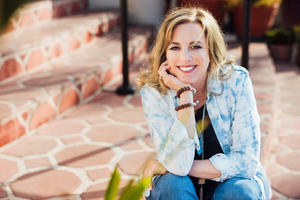 About: Author and mindfulness expert Julie Potiker is an attorney who began her serious study and investigation of mindfulness after graduating from the Mindfulness-Based Stress Reduction program at the University of California, San Diego. She is also a graduate of the Mindful Self-Compassion program created by Kristin Neff and Christopher Germer, and is one of the first people they trained as a teacher of this methodology. Julie's new book, “Life Falls Apart, but You Don't Have To: Mindful Methods for Staying Calm In the Midst of Chaos,” demonstrates an uncanny ability to transmit this information to a broad range of people — skeptics included! She holds a B.G.S. from the University of Michigan and a J.D. from George Washington University.